This supervision is for clinicians who are interested in nonverbal and embodied processes in psychotherapy and psychoanalysis. Please contact Dr. Birklein directly at (917) 496-5772. Our new book “THE MEANING OF MOVEMENT” Embodied Developmental, Clinical and Cultural Perspectives of the Kestenberg Movement Profile is available on Amazon. SYNC Psychological Services, PLLC is looking for licensed clinical psychologists to join the group. Please contact Dr. Birklein for more information. The interest group on Body and Movement in Psychoanalysis will be resuming January 2019. This will be a group for analysts who have interest in learning more about the interrelationship between the body and its movement in treatment, and about how both psychoanalysis and body/movement can enhance and inform each other. The group will focus on a combination of theory and practice with readings and discussions from different somatic, embodied, developmental and intersubjective approaches and about the integration of emotional with somatic and nonverbal processes in the analytic practice. In addition, group meetings will be interspersed with experiential and experimental studio sessions to directly explore and investigate somatic and movement processes in one’s own body. Particular emphases will be on unformulated experiences, movement and language, nonverbal processes, affect, trauma, attachment and developmental processes. The meeting time will be Wednesdays from 4:30-6:00 in Dr. Birklein’s office. Please contact her to sign up. Group meetings will be held in my office, 928 Broadway, Suite 803 (21st Street) and in a studio at that same location . This group will be limited to eight participants. Beautiful small studio in the heart of Flatiron at 21st Street & Broadway in boutique office building. 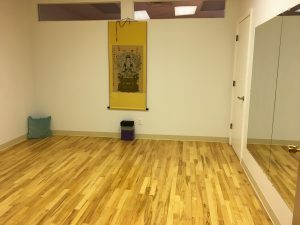 Studio: (170 sqft) newly renovated with hard wood floors, mirrors, ideal for movement, mediation, yoga, body work, etc./part-time – available by the day/hour.